Mills Bomb; Hand grenade, Number 5 Mark I. Weight: 1.5 lb/0.675 Kg. Introduced in spring 1915. Removal of the safety pin and release of the lever allows a spring to drive the striker into the cap and ignite the 4.5 second fuse. A defensive grenade which could be thrown at least 28 metres/30 yards but still required the thrower to take cover from lethal fragments. To increase this range, soldiers devised “adaptations of the Roman catapult, the use of which had to be learnt”. 2nd Lieutenant J.K. Digby, 7th Battalion the Norfolk Regiment, was killed on August 4th 1915 in throwing a bomb with a trench catapult. The Mills bomb could be converted into a rifle grenade by screwing an 8 inch rod into a pre-threaded hole in the base plug and firing it from a rifle using a blank .303” cartridge. The British offensive at Loos began on the 25th September 1915. On the 26th the 7tht (Service) Battalion of the Norfolk Regiment handed over their trenches at Ploegsteert (“Plugstreet”) to the Canadians and marched to Philosophe, near the mining town of Loos. There they occupied shallow disconnected trenches and for two weeks endured heavy German shelling which caused over 80 casualties. The 7th Battalion were due to attack at 2pm on the 13th October. Under cover of a smoke screen the Norfolk soldiers would advance in two wings and clear the enemy front line by bombing from left and right, meeting at the centre. This method of attack involved specially trained men carrying canvas bucketfuls of grenades and throwing them from one traverse of the zig-zag trench into the next. The explosions would be followed immediately by bayonet men rushing into the devastated bay. This process to be repeated until the whole line was in British hands. Unfortunately the smoke screen was stopped too soon, giving the German machine gunners a clear view before the British even went over the top. Although the bombing party on the left succeeded in taking 200 yards of the enemy front line, the right party and all reinforcements were mown down by an enfilading machine gun. So the first serious fight of this unit of Kitchener’s New Army cost the 7th Battalion 434 casualties, of whom 72 were known to be dead and another 160 were missing. The Battalion withdrew the next day to await drafts of replacements. This entry was posted in Local collections, Uncategorized, War Diary and tagged Norfolk Regiment, Royal Norfolk Regimental Museum, The Royal Norfolk Regimental Museum. Bookmark the permalink. Above all this is about the service, suffering and sacrifice of a Norfolk battalion in general and about 434 men in particular and about those others who had to live with the legacy. It is about the quality of their times. Let us not forget the missing. In one known instance of a London Territorial, lost on the First day of the Somme, 1st July 1916, his tormented family waited out the war, scoured the newspapers for images of returned prisoners of war and did not know of their son’s fate until the war office informed them in the early 1920s, that his company had been practically annihilated in the attack on Gommecourt. The 7th (Service) Battalion Norfolk Regiment was a Kitchener’s battalion raised in Norwich. Because an 8th (Service) Battalion was also raised in Norwich, we may fairly reckon that that the 7th substantially comprised 1000 men from Norwich and outlying areas (although it was open to the army to draft in numbers from anywhere in order to make up a battalion). These were K1 men, or otherwise of Kitchener’s first army or the first Hundred Thousand, who were famously raised within two weeks of Kitchener’s first call for volunteers in August 1914 and who signed up for the new General Service terms of three years or the duration. The 7th Norfolks formed part of the 12th (Eastern) division, whose device was the ace of spades. 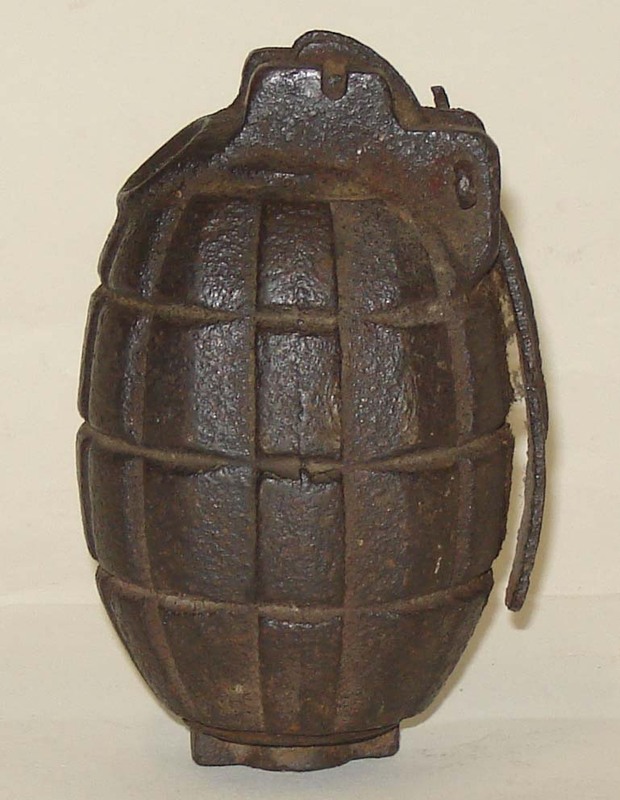 At the risk of counting rivets, the grenade depicted is not a No5 but a No23 MkII with a cast iron Hearn type base, screw threaded to take a 5.5′ rod for discharge from a rifle and supplied crated with the rods to be attached. Typically this type of Mills bomb dates to 1917. Whilst it was introduced in May 1915, very little was seen of the No5 Mills bomb until late 1915.